At The Conservation Center we are very fortunate to be surrounded by amazing art every day. It is an extraordinary opportunity to work so intimately with many great pieces created by artists whom you have studied your whole life. However, during the day-to-day we often find ourselves focusing more on the physicality of the pieces as opposed to having discussions about the many artists that sparked our interest in this field in the first place. Read on to the end of this article to find out which artists are some of our team's favorites! Recently, we had the opportunity to conserve and frame one of our regular favorites, Alphonse Mucha. When a new client set up the appointment to bring in three pieces by Mucha that she had recently acquired at Swann Auction Galleries in New York, one of our account managers could barely contain her excitement. "I was thrilled because I really love Mucha and had visited the Mucha Museum in Prague last summer. So, I was excited to see some of his pieces in person at The Center," said Sarah Phalen, Client Services Associate. Our client, Ms. Boyle, felt similarly as she had studied art history and was drawn to Mucha and the Art Nouveau movement. Ms. Boyle had wanted a Mucha of her own for some time and had the opportunity to bid on four pieces at the Swann Galleries. While one of the pieces got away, three pieces found a new home in Chicago. Two of the pieces, Winter and Spring, were from Mucha's "Four Seasons." Upon arrival to The Center, Winter exhibited darkening and was embrittled throughout. The piece also exhibited acidic content and moderate distortion throughout. There were selective stains and abrasions along the top edge. Additionally, there was a water stain within the proximity of the abraded area. 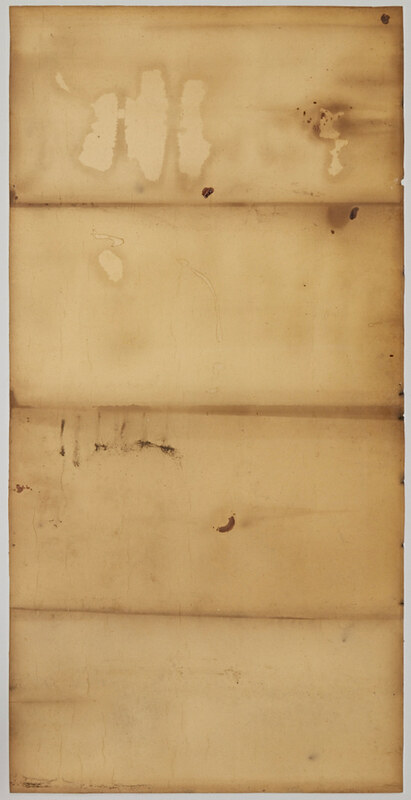 The verso of the mount exhibited severe stains and age-related discoloration. The left edge of the piece exhibited selective impact dents that appeared to have been caused by the framing nails. There was a small loss on the left edge, and an edge tear and slight delamination at the lower right corner. There was minimal water staining along the bottom edge and severe soot staining at the upper left corner. Spring was also darkened and embrittled throughout, and exhibited acidic content and moderate distortion. There were selective stains and abrasions along the top third edge. There was also water staining near the abraded area. 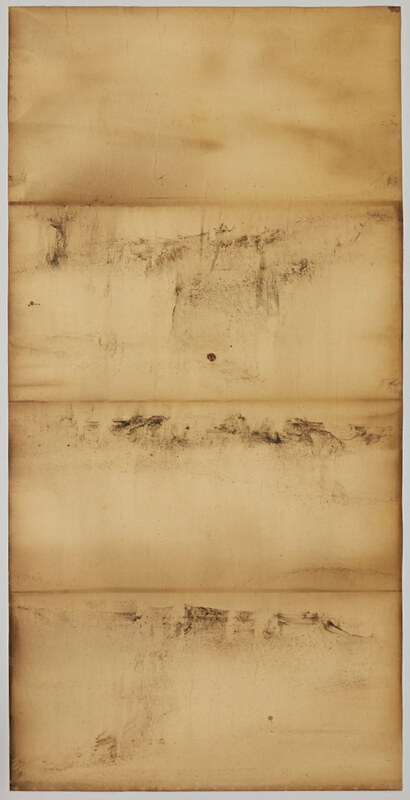 The verso of the mount exhibited severe stains and age-related discoloration. Both lithographs were surface cleaned using the appropriate conservation methods. Accretions were dusted off the surface and severe accretions were mechanically removed. The mount was deacidified on the verso. The pieces were humidified and flattened to reduce surface deformations. The original mounts were solid mounted with a buffered acid-free support. For Winter, the areas of delamination were consolidated and the tear was stabilized. The third piece that Ms. Boyle brought to The Center was an over-sized lithograph, titled La Dame Aux Camelias. Once unrolled, the lithograph, which was mounted to a textile support, measured nearly seven feet tall. The sheet exhibited minimal age-related discoloration and minor selective edge tears. There were gummed hinges and selective areas of adhesive residue and staining on the verso of the piece. La Dame was surface cleaned and the gummed tapes were lifted using the appropriate poultice techniques. The sheet was then locally humidified and flattened at the hinges to reduce surface deformations as best as possible. The adhesive residue and staining were removed using mechanical methods. After conservation was complete for these pieces, the next step was to select the perfect frame. La Dame posed a challenge due to its sheer size; however, the soft and dreamy palette was enhanced by a moon gold frame with Art Nouveau corner detailing. Winter and Spring received gold frames with foliage corner detailing, bringing out the organic lines in each piece. Ms. Boyle was pleased with the framing process: "I was delighted with the selection at The Center and they had the right attitude about the pieces. Hearing that the staff at The Center felt the frames looked nice, gave me confidence in my decisions." Toby Joyce, our Senior Framer, was equally pleased with the framing: "They look spectacular; it's very exciting to work with Mucha's pieces." All three pieces are now prominently displayed in Ms. Boyle's home, built in 1893, where they work well in the space given the age and era of the house. While she is very happy with the three Mucha's she has procured, Ms. Boyle says she is still keeping her eyes open for any special pieces that might enhance her Mucha collection. So, who are some of The Center's favorite artists? In a company-wide survey, almost everyone on the team named a different favorite artist and most struggled to limit themselves to only one.